Client PR Portfolio Spotlight: Showtime Networks, Inc.
BIZ FX MEDIA, INC., Michael's contracting-based firm, is a "marketing solutions" company, delivering years of media-oriented trade journalism and Hollywood media marketing experience. Prior to BIZ FX, Michael was employed as a media trade journalist, covering Traditional Media-oriented broadcast and cable networks, TV stations, as well as emerging New Media-oriented Internet and Mobile platforms. Michael is particularly fascinated with the ongoing deployment and build-out/upgrading of digital technologies within all forms of terrestrial signals (HDTV, SDTV, satellite, 4G, WiFi, etc. ), wired copper- and fiber optic-based signal delivery, and ubiquitous mobile/wireless broadband telephony. The ongoing, unyielding convergence between computer software programming, data storage/processing hardware devices and linear digital video content is now accessible on everything ranging from handheld video games to mobile tablets and smartphones. Along with such diversions as set-top and handheld gaming devices, automobile GPS navigation and other onboard electronics/entertainment systems, it has all further satiated both consumer and business demand for "enhanced" productivity, social connectivity, real-time news and information, and (increasingly) "immersive" entertainment, interactivity and pure escapism. Chained to his desk and Smith-Corona typewriter, it's the immortal Paddy Chayefsky, Oscar-winning screenwriter of 1976 Best Picture "Network" and 1955's "Marty," doing his writing thing in a New York sewing sweatshop (circa 1950s). We don't have enough verifiable information to know if that is his grandmother, mother or shop boss overlooking his typewritten copy. 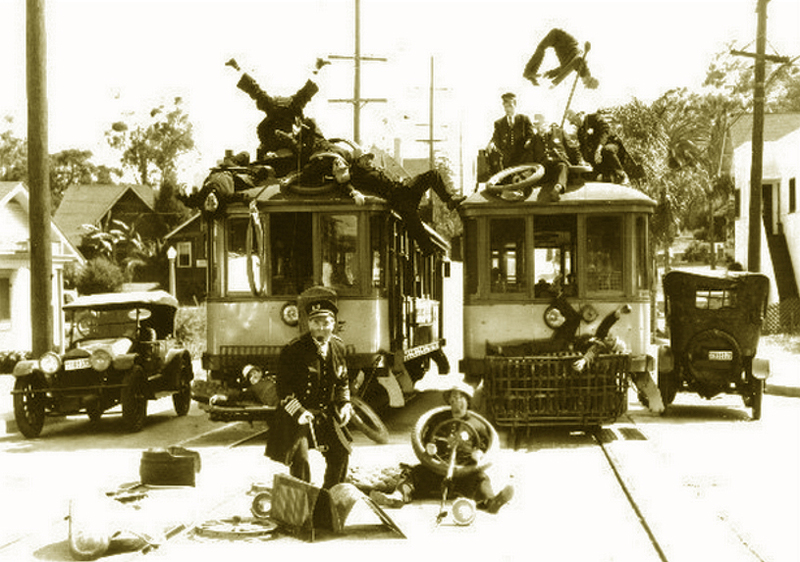 I had to just run this classic silent screen-era picture of Mack Sennett Studio's "Keystone Cops" hijacking Los Angeles' former Red-Car street trolleys (before General Motors infamously BOUGHT OUT the train lines and made LA a freeway- and street-clogged MESS for the last 60-something years). I just found the scene remarkable in trying to guess if that is a real stunt man or stuffed mannequin lying across a (faux?) power line?! Maybe you have a friend or film historian who knows the answer, please drop us a line! Art is in the eye of the beholder, and creativity is in the eyes of Biz FX Media’s clients. Above all else, whether it is Advertising, Marketing or Public Relations campaigns, we take pride in our authorship and creative design — simply following through on the inspiration we get from our client’s original vision. 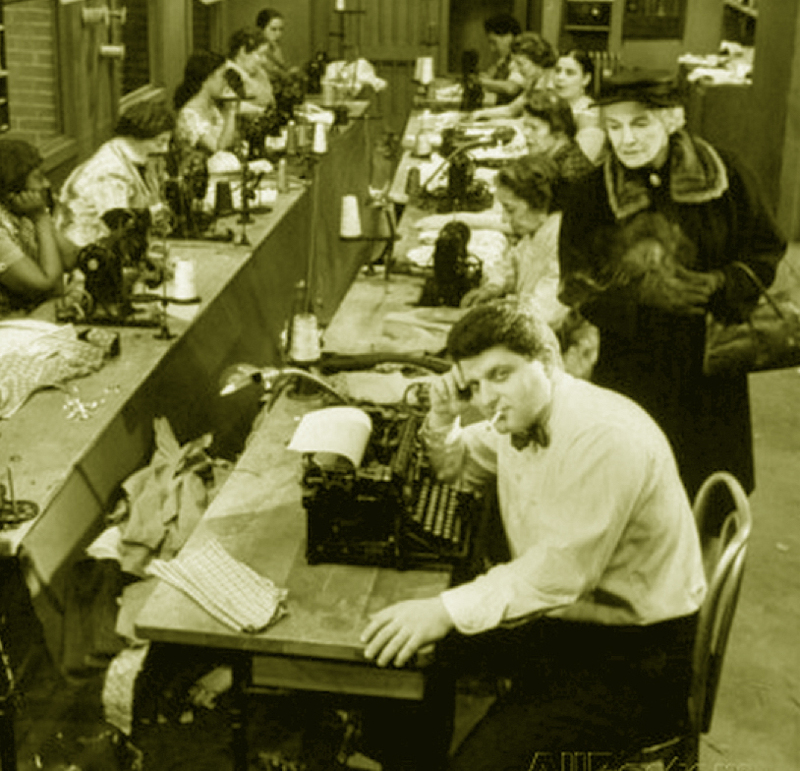 Tailoring copy to meet target demographics (socioeconomic, age, etc.). – Copywriting/copyediting of print advertising (consumer and trade), direct mail pieces and outdoor/billboard media. – Combining traditional and new media content in crafting messaging elements for interactive television, consumer- or business-facing Web sites, mobile/wireless devices, in-theatre trailers, home video, and video games. – Scripting/storyboarding for television, radio and streaming video commercial/infomercial spots. Consultation on writing Creative Briefs to distill the strategic objectives, creative brand messaging and media placement criteria for ad campaigns. Production of print collateral material including sales sheets, catalogs, brochures, spec sheets, product/service and motion picture and TV series synopses. Crafting of custom marketing kits and presentations. Focus group testing, data collection and interpretation. Development of various in-store event and promotional campaigns designed to tie-in with the client’s brand messaging/sales strategies. Authorship of corporate and series/motion picture press kits; press releases; media alerts; white papers; executive speeches; and internal/external newsletters. Insider, career perspective on how to pitch journalists/media outlets with respect to planting exclusive and non-exclusive announcements with the trade and consumer press. Negotiating with third-party vendors for electronic press kits (EPKs) and satellite radio press tours and conference calls. Coordinate and manage on-site promotional events from inception to completion for product rollouts and celebrity appearances.